Scenes in parts of France looked like something straight out of a Jules Verne novel, with cars and houses under water after a deluge of rain. Parts of Central and Northern France have been drenched by the downpour with water levels rising to over one and a half metres in some areas, in what is reported as the most rainfall for this time of year since records began. 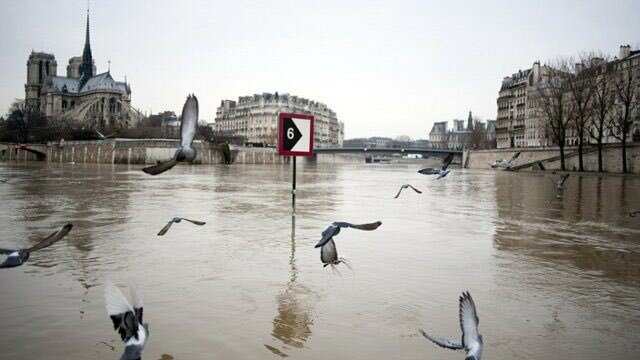 A total of seven departments across the country had issued severe weather warnings, with the Loiret, one of the worst affected areas, being placed under red alert, an extremely rare event. Firefighters and rescue services were only able to make patrols by boat, looking out for those stranded by the muddy water. In other parts of the country, traffic was disrupted, coming to a complete standstill in some areas and large stretches of motorway have been closed in others.